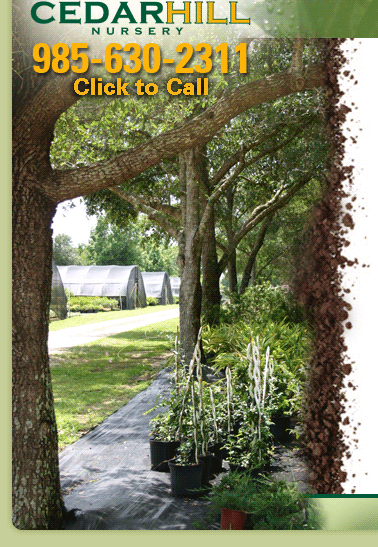 Nestled under 30 year old Live Oak trees, Cedar Hill Wholesale Nursery is independently owned and operated serving Covington, Mandeville and the surrounding areas since 1985. In 2010, we had a vision to expand. As part of our vision, Julian Holiday's Hillside Nursery was purchased. All of Julian's plants were moved to Cedar Hill combining a wide variety of native, tropical, container and field grown plants at a closer more convenient location. is to supply the Green Industry with quality services and plant materials including distinct, unusual and native varieties of trees and shrubs.